I have a few "missed concert" regrets, and pre-Hagar Van Halen will always have a place in the Top 5. Yeah, I know Dave's back more or less, but we'll likely never see the Mike/Dave/Brothers combo again unless somebody raises a billion dollars on Kickstarter. We still have the records, though, and video memories. Reading through Van Halen Rising may leave you tinged a tad green if you're in the same boat as me. Author Renoff built this book from interviews with over 200 witnesses to the early days - with Anthony as the sole cooperating VH alum - and scores of archived articles. The book is as exhaustive in detail of the band's beginning as the research done to complete it. As the title implies, Rising sticks to the genesis of the band through the release of Van Halen and subsequent early marketing of the band. If you haven't studied the band's history, you may not only find this an invaluable resource but understand Rising as almost prophetic. Well before anyone considered Van Halen might be signed, friends and supporters give insight to personalities and quirks that shape the band's legacy. You'll learn David Lee Roth had always been a showman, if not a thorn in the brothers' sides - both cheerleader and headache. You'll scratch your head at passages of well-known names who had the opportunity to sign them to their labels before ultimately passing. If you're a fan you might snicker and wonder who still kicks themselves. Moreover, you'll read a story that seems less likely to happen anymore, the gradual winning over of music fans and the industry by a band playing a style largely regarded by critics as "dead." Had they began in the YouTube age they might have eliminated the middle man like so many groups do now, but I enjoy reading stories like this. 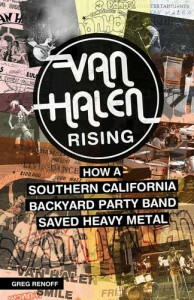 While reading this I was reminded of my husband telling me about the first time he heard Van Halen on the radio. "Eruption." He had to pull over the car to catch his breath.The spectacle on display in their early tours no doubt left a lot of people feeling the same way. It's not easy to translate that to print, but Renoff does the band justice.